War is a terrible thing. I have several friends who have served in either Iraq and Afghanistan, all of them called up from, or volunteered from the reserves. Thankfully all of them came home without any physical injury, but tragically some people I know have loved ones who have been killed or injured whilst serving their country. Help for Heroes was set up in 2007 to give practical and direct support to wounded service men and women and their families. They offer support for those with often life changing injuries and their families, for life. This year Whitworths Sugar are sponsoring Help For Heroes’ Colossal Cake Sale being held between now and the 5th May, and encouraging you to bake, enjoy cake and raise money for our heroes. There are lots of ideas and recipes for bakes on both Whitworths and Help for Heroes websites. So many of our Servicemen and women have made the ultimate sacrifice; so many lives have been lost and so many changed forever by the wounds that they have suffered in the course of their duties. For these selfless people, it is after the guns have fallen silent, the din of battle quietened, that the real fight begins – a fight that may last for the rest of their lives. I think that every bake sale needs a show stopper cake, and I’ve created a colossal coconut layer cake topped with Ferrero Raffaello coconut truffles. This is actually a very easy cake to make, a classic Victoria sponge covered with lashings of coconut frosting, made with coconut oil in place of the butter. It ticks my Fuss Free boxes, and has the requisite effort to glory ratio. Despite its name coconut oil is a solid a room temperature, it is expensive and some brands are more intensely flavoured than others, so you may want to substitute only half the butter with it. You certainly will not want to make the frosting with all coconut oil. If you are using a loose bottomed cake tin stand a baking sheet under it when baking, as I had some oil run out of my cake tin and and burn on the bottom on the oven. 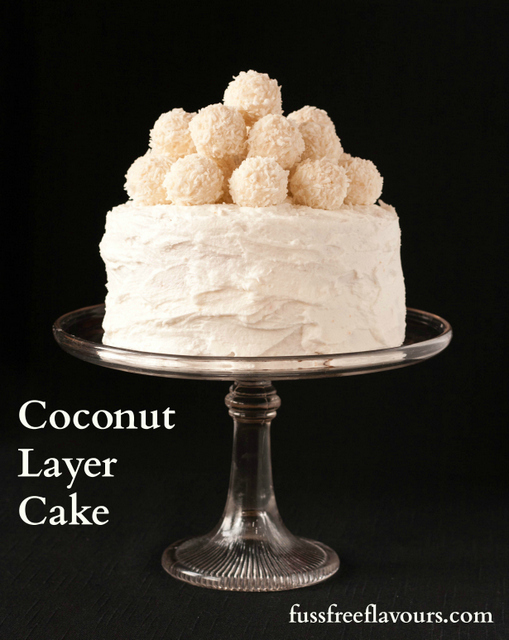 If you try this Recipe: Coconut Layer Cake please tag #FussFreeFlavours on Instagram or Twitter. It is amazing for me when for me when you make one of my recipes and I really do love to see them. You can also share it on my Facebook page. Please pin this recipe to Pinterest too! Thanks for reading Fuss Free Flavours! Cream the butter and sugar together with a hand held mixer or in your stand mixer. Add the eggs together with a tablespoon of the flour and beat well. Sieve the flour, baking powder (if not using self raising flour) and salt and fold into the batter along with the milk. Divide the mixture between the two prepared tins and smooth out using a knife. Bake for about 25 minutes. The cakes are done when risen and springy. Remove from the oven and allow to cool. The secret to really fluffy frosting is to beat the fat really well before you add any sugar. Place the coconut oil in a bowl and beat with an electric hand mixer until soft and fluffy. Slowly add the icing sugar beating as you go. Add the milk to loosen the mixture. You can also make your frosting in a food processor or stand mixer, again beat the fat well before adding the icing sugar and milk. Chill the cakes in the fridge for a few hours before frosting. Stand the cake on a chopping board and sandwich the layers together with some of the frosting, using a pallet knife cover the top and sides of the cake with the remaining frosting. 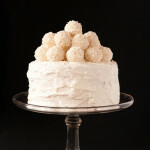 Use a fish slice to transfer to a cake stand or plate and decorate with the Ferrero Raffaello. Nutrition is without the coconut truffles.